To be honest, the first thing that drew me to Seven Days of You by Cecilia Vinesse was the gorgeous cover. How can you resist a cover that is that stunning and bright? And then I was drawn in even more by the summary for the book. As if I haven't mentioned this a lot lately, I'm going to say it again: I adore contemporary novels, and I seem to be reading a lot of them lately. (And there's absolutely nothing wrong with that!) Seven Days of You was definitely a great contemporary read! There are a lot of characters in this story that you're really going to love, including the main character, Sophia, who is full of awesomeness, and has a pretty amazing mom and sister as well. Then there's Jamie, the boy Sophie had a crush on for years, who moved away but is back in Tokyo the very same week she's leaving to move to the States. WHAT?! (Yeah, you totally want to read this book now, right?) I loved so many of these characters. They were perfection. Sigh. As I mentioned above, I can't resist a good contemporary novel. They are my favorites, and totally give me all the feels. The storyline for Seven Days of You was sweet, and completely addictive. I was hooked as I turned the pages. AND, I also absolutely loved the setting in this book. The author did an amazing job of describing Tokyo, I could totally see it so clearly in my mind, and it sounds amazing. I have to admit, I haven't read very many books set in Japan, but it totally sounds like a place I would love to visit in the future. 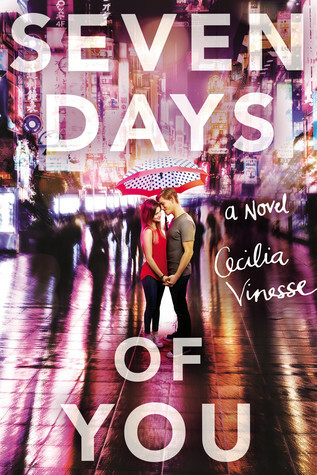 Overall; Cecilia Vinesse definitely has a hit on her hands with Seven Days of You! I, for one, really enjoyed the story, and I'm super excited to read more by Cecilia in the future! (Hopefully sooner than later. *wink*) Check the book out today! I thought this book was adorbs, but the ending left me so wanting. I am an epilogue lover. I always need more. The ending I extrapolated in my mind is amazing, by the way. Great review!